This is a very interesting case submitted by Matthew Nogrady, LMT from Orlando, Florida. It clinically demonstrates one of the concepts of Medical Massage – if a therapist deals with a long lasting chronic somatic pathology he or she encounters an ‘onion’ situation. In other words, the original pathology becomes layered up with new abnormalities which developed secondarily as various protective reactions and compensatory (including postural) changes. Matthew understood the complexity of the situation he was facing and by making correct clinical decisions he was able to peel the onion layer by layer and restore the patient’s health. A client came to me with a series of issues with the most ongoing being her weekly right side chronic headaches with acute pain affecting occipital, parietal and temporal parts of the head. Pain was radiating to the forehead and behind the right eyeball. She had headaches sometimes for days nonstop with an intensity of 9-10. She was diagnosed with Migraine and placed on heavy-duty medications. She also developed hypertension with arterial blood pressure rising significantly with the onset of the headache attack. She also had cervical and upper back pain, especially on the right side. The client was in a car accident six months prior and she was diagnosed with bulging and herniated disks in both the cervical and lumbar spine. If that weren’t enough, she was also dealing with consequences of surgeries on both feet. On the right foot surgery was done to release the plantar fascia and on the left to lengthen the Achilles tendon and repair small tears. She also had numerous arthroscopic surgeries on both knees to repair torn cartilage. Her posture during walking immediately caught my attention. Her knee problems didn’t allow for full extension, causing her to be hunched over while walking and creating a hyperlordosis of the lower back. Her posture also exhibited a head forward position which she developed as a compensatory reaction to the hyperlordosis. Her work required sitting at a computer all day and it additionally contributed to the tension in her neck and upper back. The client felt pain in the neck with rotation of the head to either side. Palpatory examination confirmed the presence of active Connective Tissue Zones in all four locations associated with Chronic Headache. The active trigger points were detected in both the upper trapezius muscles and obliques capitis inferior muscles. Further examination also revealed the presence of periostial trigger points at the insertion of the trapezius muscles to the occipital ridge and the lateral aspect of the spinous process of C2. The Bertichi’s Test was positive. Thus, based on the patient complaints and evaluation of the tissues, it was obvious that in the neck she had Trapesius Muscle Syndrome, which secondarily irritated the greater occipital nerve and triggered Chronic Headache. There was a good chance that her Hypertension was also the result of the tension in the cervical muscles since it may affect vertebral artery triggering Essential Hypertension. Considering how many health issues the patient had, I knew this wouldn’t be an easy journey. From the very beginning I made no guarantees but reassured her as long as she was patient I would do my best to help her. This would be a true test of the “Less is More Concept” I’ve come to learn in my years in this profession and as it was recently reinforced during a Medical Massage Seminar conducted here in Florida by the Science Of Massage Institute. Considering that she had so many abnormalities which contributed to great postural changes I started to address her lower back first, using Medical Massage protocol for Lumbalgia. Her lower back was very painful even with very light touch and I started by using techniques to interrupt the pain cycle and then gradually worked through entire protocol. It took me some time to be able to manage her symptoms. She was told she was going to need spinal surgery but I was able to correct that issue for the most part and currently no surgery needed. Next I followed Medical Massage protocol for Plantar Fasciitis, including a good bit of kneading on the posterior leg and thigh. My next step was to work on both knees. I reduced the tension in very tight superficial fascia followed by friction around the joint, hamstring insertions, kneading of hamstrings and finally passive stretching and Postisometric Muscular relaxation. After solving for the most part those issues to the level of only minimal reoccurrences, I was able to concentrate on her Chronic Headache. I began with Therapeutic Massage in the inhibitory regime along the neck and both trapezius muscles from the acromioclavicular joint to the occipital ridge. Then I used friction on the paravertebral muscles followed by passive stretching of the neck. I then did Scalpotherapy consisting of light Raking Effleurage and friction on the scalp. I worked on the posterior neck with kneading of paravertebral muscles and friction on the spinous processes and scapula attachments. I used Trigger Point Therapy on the trapezius and obliquus capitis inferior muscles followed by friction on periosteal trigger points at the insertion of the trapezius to the occipital ridge. At the end of the session Passive Stretching and Postisometric Muscular Relaxation were used. As soon as the client got up from the table, the Acute Headache she had before I started the therapy was completely gone. Right now she has sometimes a once per week tension headache with an intensity of 3 and as long as she does her stretches and light exercises she is able to control the headache’s intensity. She is no longer needing to take migraine medication. Matthew Nogrady received his certification in massage therapy from Florida College of Natural Health and has continued to study the body’s ability to rehabilitate itself inspired by his own injuries. 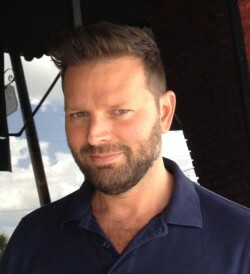 He is a massage instructor/Certified Sports Massage Therapist and has worked with Orlando City Soccer Club, Houston Astros, Rollins College Athletics, and Florida Hospital Sports Medicine/Rehab although his most rewarding experience was working on patients with Hospice of the Comforter as a volunteer.